Hayling Island Labs - After Hours: .. And in the meantime I thought it a good idea to buy a little runaround ..
.. And in the meantime I thought it a good idea to buy a little runaround .. So I am working on the big girl. 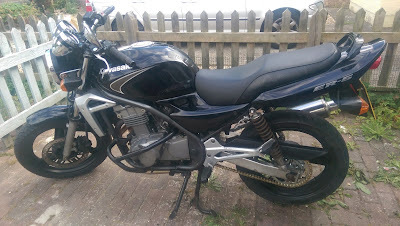 I have it in mind to do a bob/rat/chop on her .. she is mechanically very sound (probably needs the clutch sorting out along with the brakes needing a rebuild, new air filter, oil filter, new tyres, seized fuel tap, seized choke, seized throttle cables, switchgear needs sorting out, new sprockets and chain, rusty frame needs sorting out and the seat needs recovering and repadding. Front headlight is rusted out on the rim, and the front mudguard is cracked. The battery is long dead. The front handlebar bar ends are rusted out to where I am not sure it will be possible to get new grips on her). 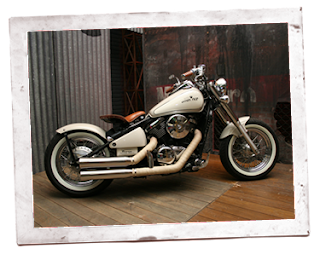 My vision statement for her is something like this ..
She is a bit of a pig at the moment though, lots of bolts shearing and so on. I did get the exhaust off, but one stud snapped, so I will have to borrow / buy EasyOffs to get the stud out. I like the wrapped look as the picture above .. the wrap comes from China, and is not too expensive. I like the idea of a matt or satin black frame where it needs repainting, satin black wheels and spokes, whitewall tyres, creamy white paint job on bobbed mudguards and tank, with an airbrushed orange edging. WS2812B LED strings around to pick out the lines of the bike at night - default colour orange again, but hey! what would be the point of WS2812 without a microcontroller doing some fancy lighting patterns. So, it's going to take a little longer to sort out the old girl than I hoped. I might make some good progress in August - anyway, it gives a window of time where I am not driving a car, and I am now working across a few of the NHS Trusts in the South. The car parking is outrageous at hospitals, and it is no better for visiting staff. It's not much better for permanent staff - they might let you park in the park and ride for a fee (!). I'm also over on the other Island quite a bit, so I thought it would be a good idea to get a little runny around kind of bike in the meantime. She was cheap, so there are some bits to tidy up. The grips need replacing, the sprockets and chain were well beyond sell-by date, the rubbers on the pegs are worn. But she starts first time, which is one of the the major requirements of a commuter bike. 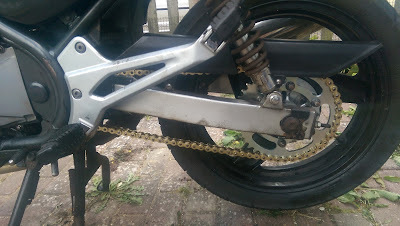 I've got some new grips on order from China, and very pleased with the gold chain and replacement sprockets. Might have to replace those shocks and springs sometime - they look a little shabby. But then I am in danger of spending more time and money on the little runaround that keeps me on the road, when I should be spending money on the big girl.